One other things none of you have taken into account is the liquidity of the rosters. In a little over a month teams will be cutting down their rosters significantly. I have to imagine that some seasoned CBs will get released, and I foresee the Lions possibly making a late signing. It will all depend on how well the rookies do in the pre-season games, and in just how confident the coaches are that they will improve throughout the season. Call in other teams garbage, or whatever you want. Over the past couple years the Lions have built a pretty decent roster using other teams "garbage". Absolutely. And I suspect that is exactly where our #2 CB is going to come from. I hope we do find our #2 CB in a few weeks, but I hope even more it isn't another Eric Wright. ALLEN PARK -- Detroit Lions coach Jim Schwartz is getting used to this new era of NFL football practices. Schwartz was raised in an era when teams practiced three times a day (three-a-days) in training camp. Running an Oklahoma drill was the not only expected, but anticipated. Players often practiced until they passed out from exhaustion. Today's NFL is much different. Players are not allowed any contact in the offseason. Voluntary workouts, organized team activities (OTAs) and minicamps resemble a glorified flag football game due to the lack of hitting. Lions players were not in full pads until Tuesday. His team has today off, because according to CBA rules, players must have one day off within seven days of training camp practice. "I think times change," Schwartz said. "It's an evolution. I was one of those guys in college doing three-a-days, but I guarantee our pace of three-a-days didn't look like what these guys went through over the last five days. It's all relative. We take advantage of when we've been on the field. "Our practices have been a little bit longer this year. We were very rarely over two hours and 10 minutes, two (hours) fifteen (minutes), in the past in a single practice. A lot of times we're two-and-a-half, two (hours) 35 (minutes). We're getting a little bit more work. Players are working really hard in walk-throughs, the meetings, the lifting. Times change." While Schwartz, and many veteran coaches, have been forced to adjust their practice approach, he understands why times have changed. "Our players are in very good shape coming into training camp, which when everybody was doing three-a-days, and having boot camp for training camp, guys were coming from jobs laying concrete, working for an insurance company, and everything else," Schwartz said. "Part of the deal in training camp was to get in shape. For the most part, our players are in very good shape coming. You got to get into football shape, but that's a big difference between doing calisthenics and all the other stuff that used to go on." Detroit will resume training camp practice on Thursday at its Allen Park facility. Schwartz will conduct a practice he was not raised with, but is getting used to. "Training camp has changed significantly," Schwartz said. "There's no more whatever kind of drills you want to call them. We're not going to line these guys up 20 yards from each other and have them go run into each other. These guys are way too explosive and way too fast, but there are some things we can do on a controlled basis. "They need to have some contact. They need to have some competition, and see what happens when you blow the whistle for the first time. Around here, it's very rare that you hear a whistle on our practice field. (Tuesday) you heard it a lot more because we were doing some live periods. You got to take advantage of if when you can, but they are few and far in between. That's life in the NFL." Im kinda interested to see what happens with James Bryant at FB. Its been a while since we've had a bruiser back there. ALLEN PARK -- The Detroit Lions will resume training camp today after enjoying a day off yesterday. Coaches and players will hit the field at 9:15 a.m., and practice is open to the general public. -- Goodell in Allen Park: NFL Commissioner Roger Goodell is supposed to attend Lions practice in Allen Park today. Goodell attended training camp practice in Green Bay yesterday. With all of the off-the-field incidents that plagued Detroit this offseason, it will be interesting to see if Goodell addresses the Lions' seven arrests this offseason with the media. -- Delmas' knee: Lions safety Louis Delmas missed practice on Monday, plus had light work on Tuesday, all due to his left knee. Delmas spent most of Tuesday's practice with ice on his knee, but coach Jim Schwartz said it was just a preventative measure. There is no denying that Detroit's success in its secondary hinges on Delmas' health this season. -- Other Lions key injuries: Lions left tackle Jeff Backus has missed practice recently due to a left thumb injury, while running back Mikel Leshoure (hamstring) and Jacob Lacey (knee) also have missed time. We need to see if the health of those players improved with another day of rest. -- Receivers catching attention: Titus Young has been pretty much unstoppable this offseason and in training camp, but Lance Long has also played extremely well. Could Long become this year's underdog who Lions fans cheer for? If he can carry this momentum into preseason games, the answer might be 'yes'. -- Kellen Moore's progression: He does not have the strongest arm, but Moore is becoming more accurate as becomes more comfortable in Detroit's offense. The Lions do not have to keep three quarterbacks this season, so if Moore wants to make a case to be on Detroit's 53-man roster, he needs to take it up to another level. 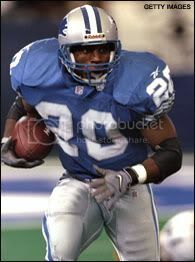 The Lions' dream scenario is that Willie Young completely breaks out next year and we sign him to a multi-year contract worth around $6 mill per year, then sign Brent Grimes or Marcus Trufant to a LONG-TERM contract, then pick up an offensive lineman in the 1st and 2nd round of the 2013 NFL Draft. if young breaks out and has a big year like avrils last season than he would have no reason to sign a $6mill per year deal. thats not what top DEs make, this is the same stupid argument that is going on with the avril thread. I'd be surprised if we kept a FB this year. We used Heller as an H-back last year. He's a good utility guy, and that frees up a roster spot of an extra running back or wide out. Lions running back Jahvid Best said over the weekend that he isn’t worried about concussions ending his career. There seem to be plenty of people worrying about that for him. Best has seen or spoken to many doctors since the concussion that ended his 2011 season and he continues to consult with them while waiting for the green light to resume his NFL career. Commissioner Roger Goodell was at Lions camp on Thursday and said that the league is monitoring Best’s condition “very closely,” although he said that the league isn’t making any push to influence the date Best is cleared to return to football. The NFL’s interest in Best’s condition isn’t surprising given how much attention concussions have received from the league and how many lawsuits they are currently dealing with on the topic. The amount of time that it has taken Best to get cleared and his history of concussions in college only make it more of interest to the league. Lions General Manager Martin Mayhew said this week that the team expects Best to be cleared “eventually,” but offered no specific indication of when that clearance might come. Coach Jim Schwartz also shied away from specifics on Thursday, but gave a little bit more of an idea about the time frame that the Lions are operating under regarding Best. If medical clearance keeps getting pushed back, the questions about Best’s fitness to ever return to football will grow louder and come more frequently. Lions defensive tackle Nick Fairley’s court date for marijuana possession charges has been delayed until November, but he’s still got a big meeting in the near future. NFL Commissioner Roger Goodell is at Lions camp on Thursday and said that he plans to speak with Fairley and running back Mikel Leshoure about their arrests this offseason. Both men were arrested twice and Leshoure has already been suspended for two games by the league as a result of his malfeasance. Fairley could be suspended before his marijuana case comes before the court and he also has an August 14th court date scheduled on DUI charges. While speaking to reporters at Lions camp, Goodell talked about the busy offseason of arrests in Detroit. He said that all players, coaches and teams have “an obligation” to hold up a higher standard than the arrests provide and that the steady stream of news about arrests detracts from the good things about the league. ALLEN PARK -- Hall of Fame coach and legendary broadcaster John Madden has seen enough from Calvin Johnson's brief five-year career to consider the Detroit Lions wide receiver among the best to ever play the position. "He is one of the greats," Madden said. "I don't know how much he has to do other than longevity, and they get into rings now, how many rings does he have and all those things. Just looking at him, as a pure player, he's a great player. He's great right now. In fact, sometimes you just watch the things that he does, he's scary good." Madden has certainly seen his fair share of great receiving talent, providing color commentary for games involving Jerry Rice, Terrell Owens, Tim Brown, Randy Moss and Chris Carter. Madden also coached Hall of Famer Fred Biletnikoff for 10 years in Oakland. Madden, who retired from the broadcast booth in 2009, is still impressed by gifted athletes like Johnson. "I'm going to try to get a picture or something with him here today like a fan." The two are uniquely tied together this season since the star receiver will be appearing on the cover of Madden's video game series. The fans voted for Johnson to receive the honor in a tournament with 63 other players. He defeated Carolina Panthers quarterback Cam Netwon in the finals. There has been some concern among fans that Johnson is now exposed to the Madden curse, which suggests a player will suffer an injury or significant statistical decline during the year they appear on the cover. Madden, who graced the cover for many years before they started using players, joked he never suffered a pulled hamstring, Achilles injury or concussion during that time. He also indicated he wasn't worried about Johnson. "He's safe. He's too good not to be safe." I was reading some fantasy football WR rankings, and this particular site had them broken into tiers, with Calvin having his OWN tier....called the Megatron Tier. Hell yes. No one can give a timetable on when Jahvid Best will return to football, but this much is clear: It won’t be anytime soon. Best has not been cleared for contact since he suffered his second concussion in two months last October in a Week 6 loss to the San Francisco 49ers. He finished last season on injured reserve, took part in organized team activities and minicamp this spring, and is currently on the physically unable to perform list. NFL commissioner Roger Goodell said during a visit to camp today that the league is monitoring Best’s situation “very closely” but that his return is solely in the hands of doctors. “We’re not influencing those decisions,” he said. Still, the NFL has been besieged by lawsuits in recent months from more than 2,500 former players claiming the league didn’t do enough to protect them from brain injuries. With so much litigation pending, Goodell said teams are managing concussions more carefully than ever. “The Lions are taking a very cautious approach, which is the correct one,” Goodell said. “And it’s a medical decision and the medical people make those decisions. And that’s true throughout the league. With Best out and Mikel Leshoure battling a hamstring injury, the Lions are short-handed at running back a week away from their first preseason game. Leshoure said he’s “getting better,” but he has not practiced since Sunday and is missing valuable reps considering he sat out all of last season with a torn Achilles tendon. Kevin Smith, Stefan Logan and Keiland Williams shared most of the work in his absence. “Every day’s important, otherwise the other guys wouldn’t be out here practicing,” Schwartz said. “We talked about Jeff (Backus practicing with a cast on his thumb). Jeff can go out and be able to accomplish his job. Mikel’s not at that point yet. And regardless of how much it’s affecting him or anything else, it doesn’t matter if he can’t get out on the field. we're the season with a Rb situation thats almost as scary as it was at the end of last season. WJB is right...there was a certain RB we REALLY needed to pursue this offseason. Oh now you did it.